What it is: Rich, oil-free cream-gel plumps skin with 24-hour hydration. What it does: Lush formula instantly rehydrates thirsty skin. Keeps skin comfortably plumped, even 24 hours after you put it on. Daily use helps fortify skin's moisture barrier to keep moisture in and environmental irritants out. A better barrier means happier skin. Oil-Free. Non-Acnegenic. Dermatologist Tested. Ophthalmologist Tested. 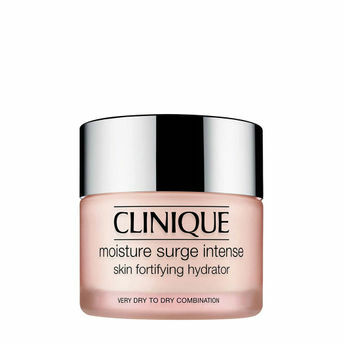 Clinique Moisture Surge Intense Skin Fortifying Hydrator range.